Summer is the ultimate time for play. The Midway Channel Gallery invites you to celebrate the art of play at our opening reception of Play/List. In an age of digital connectivity, the sharing of information, thoughts and experiences has become easier than ever. In the same way that one compiles a playlist of songs from different musical groups or genres, artists Drew Pate and Adam Eddy seek to bring together work with varying subject matter while exploring the idea of play as a serious tool in art making. 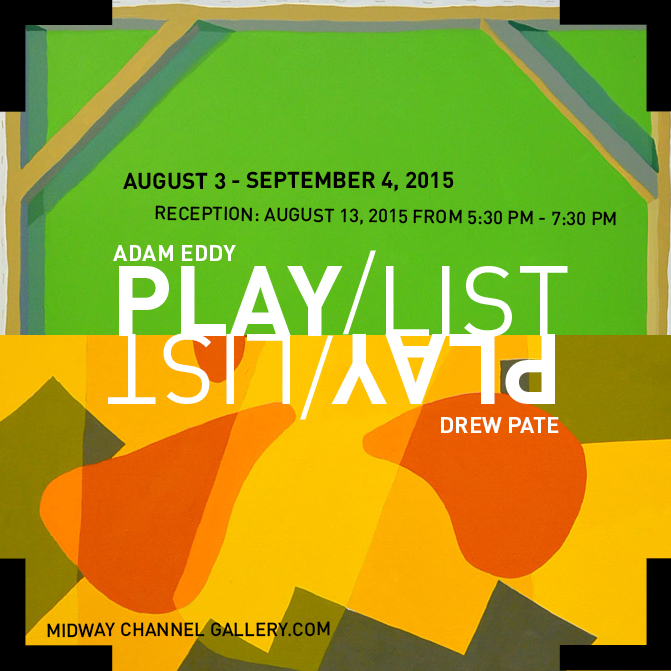 Play/List is on view through September 4, 2015. More details. The Midway Channel Gallery is nestled within Midway Artist Studios, Boston's largest live work rental artist building. Shows represent the diverse cross-section of local and international, professional and emerging artists, producing contemporary art in a variety of media. The artist run gallery mounts inclusive shows presenting a multitude of viewpoints.The Midway Channel Gallery also runs an integrated performance and visual art space, Art Under The Stairs, located on the gallery's lower level.